Tinder is introducing “Verified Profiles” so that famous people can use the dating app more efficiently and also be just as miserable as the rest of us in knowing that there are, at once, way too many dating options in their vicinity and not one person out there in the world who will love them unconditionally. Each day, 26 million matches are made on Tinder, and we do our best to keep those matches real — that’s why we’re rolling out Verified Profiles. 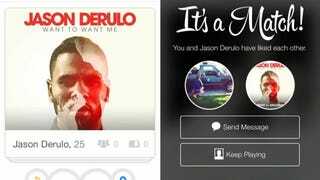 While there are some C/D list celebs with seemingly genuine Tinder profiles (friends of mine have spotted Saigon and Pras from the Fugees on the app), others like Mindy Kaling and Jason Derulo have used it as a promotional tool.